This has been a long-delayed post. It's now more than a month - indeed, nearer two months - since I returned from my transatlantic knitting cruise, but I feel I need to finish the account of the places I visited. I now have quite a different mental image of the north Atlantic after my cruise from Copenhagen to New York. Before this trip I think I imagined this area as a vast space of nothingness, but I now see it as a series of stepping stones that link Europe and North America. 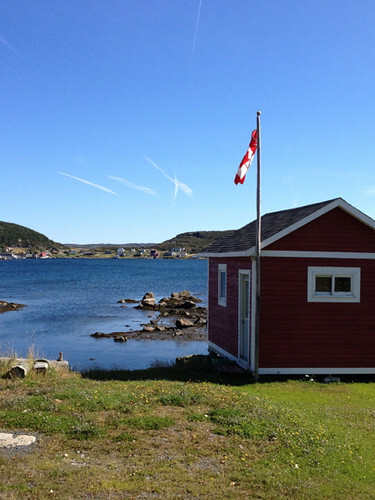 There was no more than a day at sea between any of our destinations, so that when we finally reached St Anthony in Newfoundland it seemed just another of the icy northern lands where stoic people had made accommodations to live in challenging environments. I hope the locals aren't insulted by my saying that the town itself is rather charmless, though from my brief visit it's clear that the hills and forests that surround the town offer wonderful opportunities for walking. 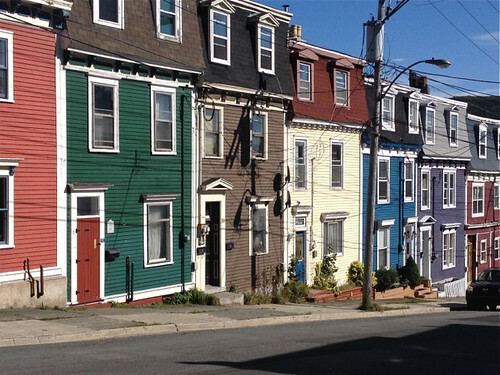 I grew up in a small town in rural Australia called Grenfell, which coincidentally has almost the same small population, around 2500, as St Anthony Newfoundland and Labrador. However, Dr Wilfrid Grenfell, who features so largely in the history and current well-being of Newfoundland, is an altogether more admirable figure than the nineteenth century Gold Commissioner after whom my home town is named. Located in the Grenfell Centre in St Anthony is a small but very well-curated museum that focuses upon Wilfrid Grenfell who brought medical services to much of poverty-stricken Newfoundland and Labrador in the early twentieth century. 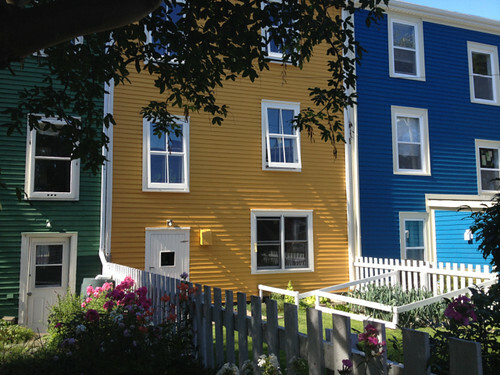 As well as recounting Grenfell's achievements, the museum graphically depicts the deprivation and hardship undergone by the residents of the maritime provinces at that time. 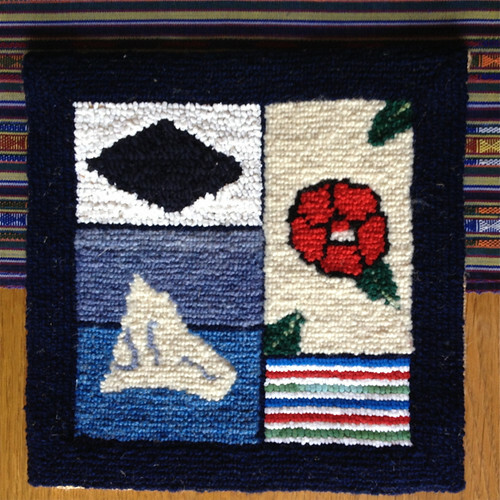 The Centre also has an excellent tourist shop that includes a range of handcrafted items, including examples of hooked rugs for which the area is well-known. 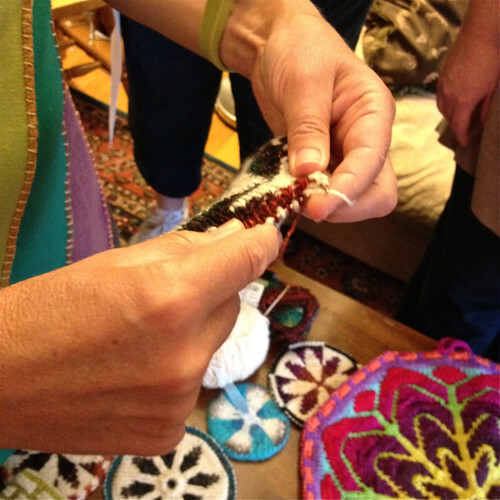 I don't need another hobby, but if I did I think rug-hooking might be near the top of my list. St John's had a number of shops selling locally made handcrafts of wonderful quality. 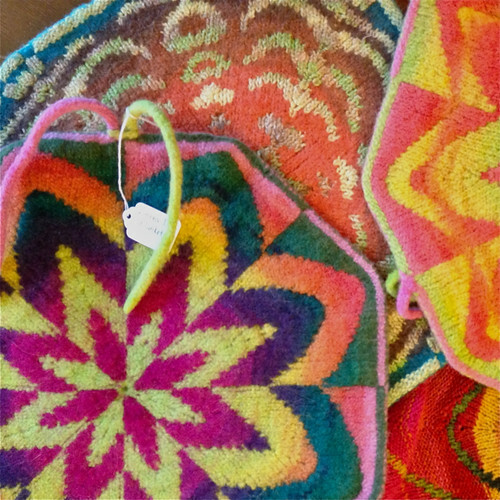 There were more examples of the hooked rugs that combine fine craft with charmingly naive designs, and lots and lots of handknitting - jumpers, hats, scarves, mittens in a riot of cables and colourwork designs. Despite all the temptations I bought only some patchworked coasters. 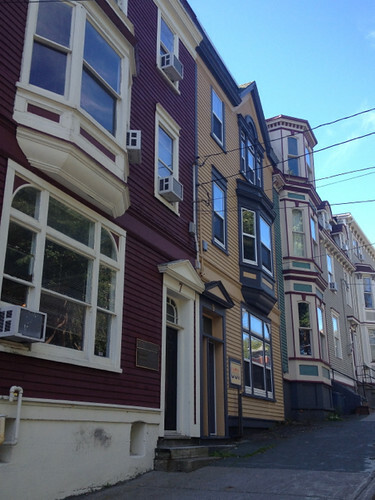 I think I was spoilt for choice and too distracted by the architecture of the hilly streets. I even happened upon a film crew packing up for lunch after filming an episode of Republic of Doyle, a Canadian tv series set in St John's that I'd enjoyed watching half a world away. 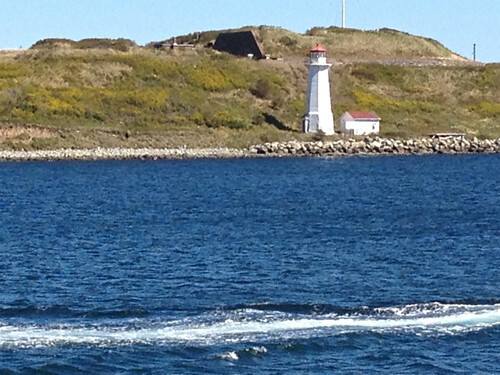 Our visit to Halifax in Nova Scotia was much more focused upon yarn and knitting. Much to my surprise, I found I have no photographs of the city itself, though I have many of our yarny activities. We had the great privilege of visiting Lucy Neatby of Tradewind Knitwear Designs in her home, which also serves as her studio. With her brightly multi-coloured hair and clothes, Lucy is all-of-a-piece with the riotously coloured knitting she designs. 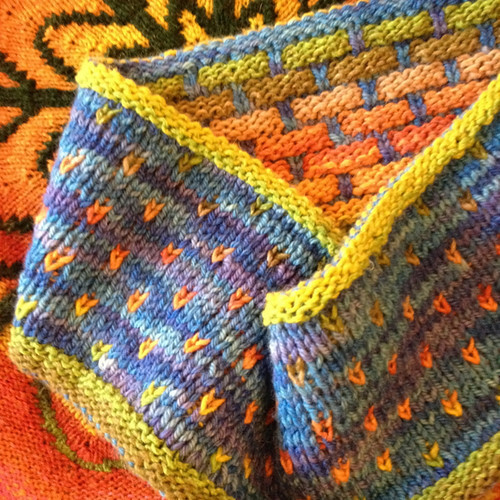 She's a designer who follows her passions, and at present her passion is for double knitting. 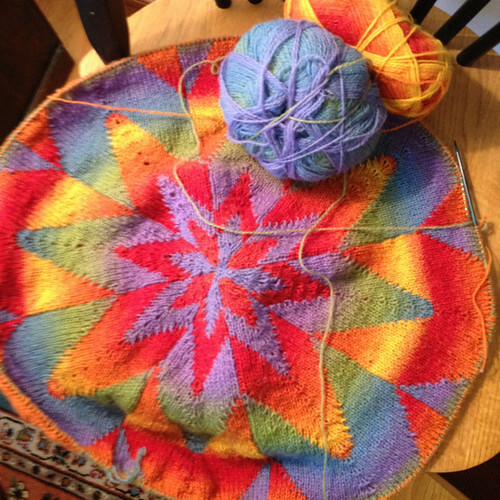 She's exploring the possibilities of this technique in all kinds of ways, but the most interesting (for me) are the floral mandala-like pieces that can serve as pot-holders, table mats, even blankets if the knitter is sufficiently enthusiastic and skilled. 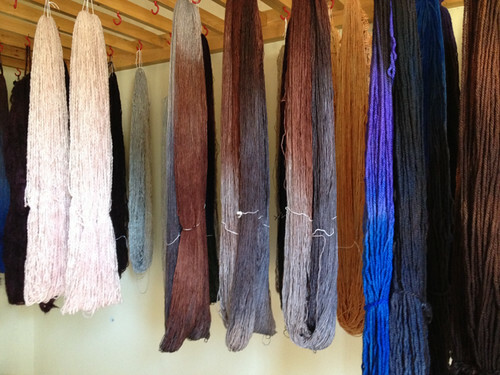 We also visited the dyeing studios for Fleece Artist and Handmaiden yarns. Watching the dyers was mesmerising. It requires a combination of skill, experience and intuition to get the colours 'just so'. While there are colours that are repeated again and again because of their popularity, we were told that each of the dyers inevitably has favourite combinations and that this capacity to experiment brings continued freshness and innovation to the range of yarns that are produced. 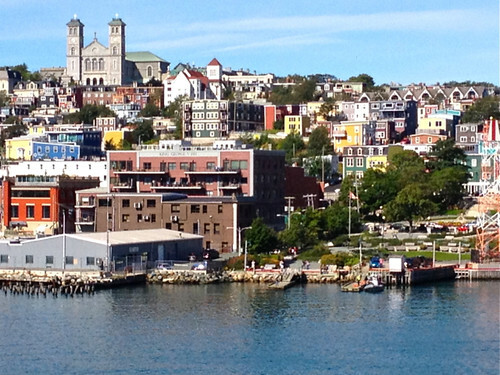 As with other places we visited on the cruise I was left wanting to see more of the maritime regions of Canada with their distinctive history and traditions, and their focus on crafts and fibre.